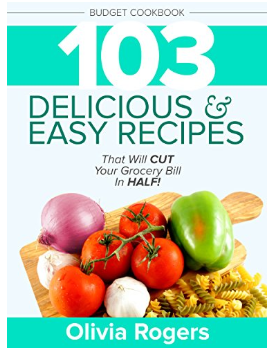 Amazon has Budget Cookbook: 103 Delicious & Easy Recipes That Will CUT Your Grocery Bill in Half Kindle Edition for Free. Imagine making the tastiest and most delicious dinners for your entire family that cost under $10! Olivia Rogers, presents the most popular and best selling “family budget dinner cookbook” on Amazon, which includes a compilation of the most delicious budget dinner recipes as voted by Olivia’s 10,000+ readers and fans. You are guaranteed to find a few winners here with your family!